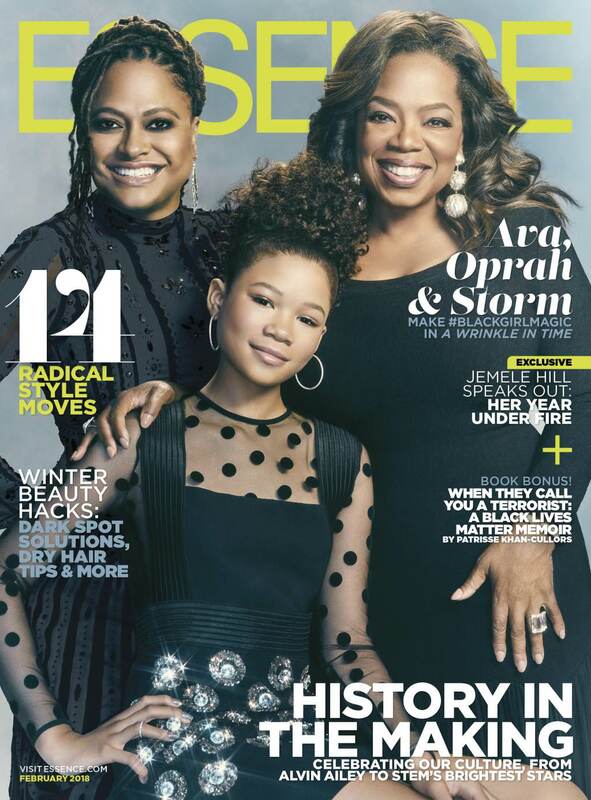 Learn more about the exciting film adaptation of the classic children's novel A Wrinkle in Time in the latest issue of Essence magazine. 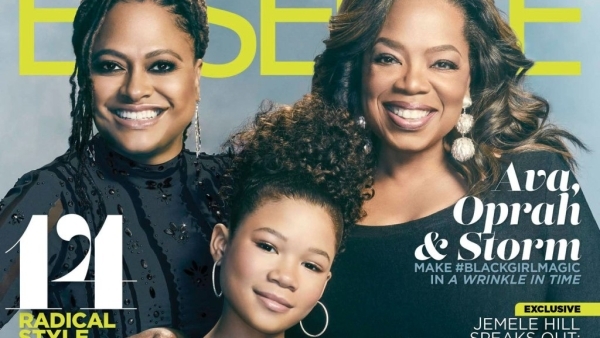 The February 2018 issue of Essence is out today and the interview with Ava DuVernay, Oprah Winfrey, and Storm Reid is a fascinating read. The upcoming movie is on my list of must-watch flicks and I'm even more excited after reading the article. The movie follows young Meg Murray (Storm Reid) who goes on a quest to other worlds in search of her lost father (Chris Pine). Along the way, she's helped by three mystical beings: Mrs. Which (Oprah Winfrey), Mrs. Whatsit (Reese Witherspoon) and Mrs. Who (Mindy Kaling). Essence Magazine caught up with Ava, Oprah and Storm for an interview about the impact of the film and the unexpected journey to making the flick. Here are some things I learned from reading the February 2018 article "A Different World" by Britni Danielle. The book is beloved by fans but one person who’d never read the book is Ava DuVernay. Wrinkle in Time is a science fantasy novel written by American writer Madeleine L'Engle, first published in 1962. The book has won the Newbery Medal, Sequoyah Book Award, and Lewis Carroll Shelf Award, and was runner-up for the Hans Christian Andersen Award. Ava admitted she had very little interest in the book much less a movie. DuVernay admits she’s only interested in telling inclusive stories that highlight people of color. The book seemed like an unlikely project for her. But Tendo Nagenda, executive vice-president of production at Walt Disney Studios, asked DuVernay to keep an open mind and convinced her to read the novel. Everything changed for her after that. "I read it, and of course, as any reader, you put yourself in the book. You B see people that you know inhabiting the world," DuVernay says. "So when I went in to talk to him about it, I said, ‘This is how I see it. I see this as being multicultural, even down to the main character.’ I’m like, ‘She’s gotta be brown.’ "
Oprah has seen and heard a lot but came from humble beginnings in rural Mississippi. She's a living legend from her highly rated talk show, her global media empire, and philanthropy which earned her a 2013 Presidential Medal of Freedom by President Barack Obama. Plus she’s been in ground-breaking films like the Academy Award-nominated film The Color Purple, and Beloved. But even now some things blow her mind. When Essence asked her what it would have been like to watch a movie like Wrinkle in Time when she was young she said it would have "probably blown" her head off just to see it. She can't imagine it "but now other 6-year-olds and 7-year-olds and 10-year-olds and 14-year-olds and grown people will see it and will have the impression of what is possible," she said. "And that impression of what is possible will live inside them." The twelve-year-old main character Margaret "Meg" Murray isn’t specifically called white in the novel, but every portrayal and illustration of Meg shows her as Caucasian. She’s described in the book as having a “mouthful of teeth covered with braces”. She wears glasses and has “mouse-brown hair” that “stood wildly on end”. The last time Disney had produced a live-action version of the book was in 2003 in made-for-television fantasy film directed by John Kent Harrison and starring Katie Stuart. DuVernay insisted that the character should be a girl of color. This is a huge gamble because movies starring young girls, much less black girls, are rare and generally unsuccessful. There are some exceptions like Eve’s Bayou, Annie (2014), Akeelah and the Bee and the animated movie Home. But it was the only way DuVernay would take on the project. Surprisingly, Disney was open to the idea. Not only that but the article reveals they expected her to "create a film full of characters from diverse backgrounds". Nagenda challenged DuVernay to go even further. "He said, 'Beyond the people, imagine the world, Ava. You get to create worlds, create whole planets.'" This is 14-year-old Storm Reid’s first leading role but she did land a role in the Academy Award-winning film 12 Years a Slave as Emily. DuVernay told Essence the girl is extremely talented. "This girl is a generational talent," the director says. "This girl is 14 years old; she’s not a kid who gets lucky with a performance. You couldn’t just have a kid who could come in and say the lines well. The person has to be a deep-rooted, real actor. And Storm was the one." The film looked around the world for an actor to play Meg before settling on Reid. But there was a big problem. While Reid impressed DuVernay during her audition she was already committed to another Disney project. "I couldn’t see anyone else besides her in my own head and heart once I saw her audition," Ava says. "She was so perfect in the role." "Ava fought for her," Winfrey explains. "I remember when they put out the search all around the world and then I remember when Ava said, 'We found her, but she’s with Disney.'" Most directors would have just moved onto another actress but DuVerney wouldn’t give up. "Ava went to the higher-ups and she fought for her and said, 'I want her.'" Oprah remembered. "First the answer was no, but she wouldn’t take no for an answer. She hung in there and she fought for her." When writer Madeleine L'Engle first tried to get her book sold it was rejected by many publishers. In her words, it was because the book was "too different," and "deals overtly with the problem of evil, and it was really difficult for children, and was it a children's or an adults' book, anyhow?" At the 2018 Golden Globes, Oprah Winfrey made headlines with her impassioned speech on the future. One line that resonated with many was this. "I’ve interviewed and portrayed people who’ve withstood some of the ugliest things life can throw at you, but the one quality all of them seem to share is an ability to maintain hope for a brighter morning — even during our darkest nights," she said. The theme is being carried to a new generation and Oprah Winfrey says the timing is perfect. Oprah's life mission to bring positivity to the world and her role as Mrs. Which feels like a manifestation of that. "Being able to sound the alarm to the rest of the planet that darkness is spreading so fast. And how rage leads to violence and violence begets war and war begets catastrophes. It sounds as if we’re talking about what’s happening in our world right now," she says. "I feel like I called that in even when I didn’t know I was calling it and that it was obviously meant to be." 6. Ava DuVernay Doesn't Care About Being "First"
DuVernay is the queen of firsts. She was the first black female director to be nominated for a Golden Globe Award for Selma in 2014. She’s also the first black female director to have a film nominated for the Academy Award for Best Picture. On top of that, she was nominated for the Academy Award for Best Documentary Feature for her film 13th in 2016. "When I’m introduced as the first this, first that...it sounds like Charlie Brown’s mom to me. It doesn’t mean anything to me. It’s not anything I earned," she says to Essence. "I don’t allow myself to take it in like it’s real. I’m trying to have all of us up in there and more. I don’t want to be someplace by myself. I don’t want to be on a pedestal as the first this and that. That’s so wack; that is the old way of thinking." 7. Storm Reid Says the Role is a "Milestone"
Meanwhile, Storm Reid is handling it too. Even though this is her first starring role Storm says she can handle the pressure. "I had a little pressure when we first started the movie. When we were filming, I wasn’t thinking generations and generations are going to love it. I was nervous because it was my first leading role," the teen says. "This is a huge milestone in my career, to be in a movie with Ava DuVernay directing and Miss Oprah being in it. When I think about it, I don’t really know how to feel. There are so many emotions. But it’s just a great blessing that will forever change my life." You can watch a behind-the-scenes interview here and check it out more in the February print edition on sale now. What do you think about the interview? Are you looking forward to the movie?